With our German Write right teaching activity for the topic "Colours" you can introduce the written texts in German for Colours. The German is displayed on a large scale and can be hidden, highlighted, edited and saved to custom labels for use in other activities. 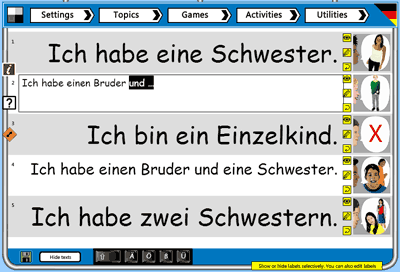 Write right is an effective activity for introducing or reviewing written language in the German MFL classroom. Texts are displayed in sets of 5, 10 or 20 and can be edited. The Write right activity enables you to show all the pictures in a topic with the written language in one go. You can show or hide individual texts as well as all the texts at once. The standard audio for each text can be played as required. Each text can be edited - special characters are supplied for each language. On the Settings page select the number of pictures to use. It is often better to show half the topic at a time as the texts are then larger (you can go from first to second set using on-screen arrows). Click on the 'Let's go Teach' button to enter the activity. All texts are hidden by default. To reveal individual texts, click on the eye button for a picture. Click it again to hide that text. Each picture also has a speaker icon for playing the speech. You can edit the text by clicking the pencil icon. This opens a small on-screen keyboard for special characters. Edit text using your keyboard and any special characters required. Fix your edit by clicking the pencil icon again. To revert to the default text, click the 'return arrow' icon for that picture. To show all the texts at once, click on the 'Show all labels' button. Click on it again to hide all the texts. If you are viewing part of the topic, use the arrow button to move between first and second sets of pictures. If you have created a set of texts that you want to save, click the save button (subscription only). Note for subscribers: only save a custom label when you have edited all the labels in a topic (10 for primary, 20 for secondary). Write right will not allow you to save labels if none have been edited.